Every time I visit or pass a Chick-Fil-A, it’s slammed, inside and out! It’s quick, it’s easy, it tastes good and there’s a play area…major plus! 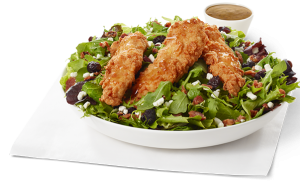 Most Chick-Fil-A locations have a kids-eat-free night once per week…SUPER plus! Everyone wins! But, WAIT! You’re making your kids and taste buds happy, but what are you doing to your waistline? Don’t Be Fooled By Salad! If you think you’re doing well by eating the Honey Peppercorn Salad, think again! Aside from the milkshakes, this salad has more calories than anything else on the menu! That goes for the Cobb Salad as well with greater than 500 calories and that doesn’t count dressing. Want to know what to order that won’t break your calorie bank for the entire day? Well, here you have it! I’ve done the math for you! Thank you so much and thanks for visiting my blog! Isn’t it? I’m so grateful chain restaurants are required to provide calorie info now! I have never eaten at one! I hear you about salads because that is what I love and I know they can be loaded with all kinds of calories/fats/carbs! Chick-Fil-A is so popular around here! Some salads are great and can be super healthy! It’s usually bacon, croutons and dressings that add loads of calories and fat. Thanks for the comment!